Is he really Robin Hood? Daffy Duck's base features a bow and arrows and "WANTED" poster! From the Merry Melodies cartoon short Robin Hood Daffy. In the Merry Melodies cartoon short Robin Hood Daffy, Daffy Duck tries valiantly to convince Porky Pig that he is indeed the legendary Robin Hood. 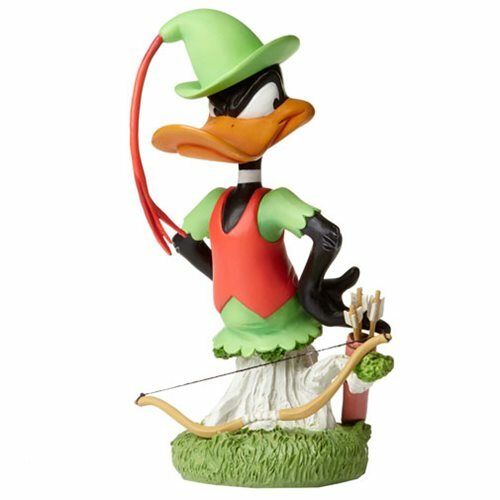 Measuring about 7 1/2-inches tall x 4-inches wide x 4-inches long, this terrific stone-resin Looney Tunes Daffy Duck as Robin Hood Grand Jester Mini-Bust recreates that skit, complete with a detailed base boasting a bow and arrows and "WANTED" poster! Ages 13 and up.